The challenges facing production have grown enormously, leading to increased complexity: e.g. high variant diversity, short delivery times, fast process adaptations, smaller batch sizes up to batch size 1. 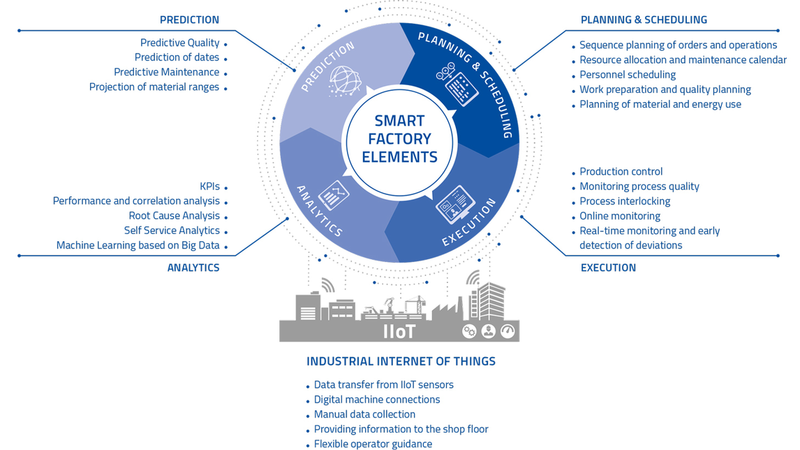 In times of industry 4.0, this is clearly a case for the Smart Factory - which in turn needs certain processes and functions in order to meet the growing requirements: the Smart Factory Elements. The Smart Factory Elements form a control loop. This provides that production is planned (Planning & Scheduling) on the basis of specifications from different sources and that this planning is then implemented (Execution). The collected data is analyzed (Analytics) in order to derive predictions. The findings from analytics and prediction then flow back into planning. The Industrial Internet of Things (IIoT) supports this cycle by collecting and providing data. A large part of these tasks can already be mapped today with an MES such as HYDRA - for others, new products will gradually come onto the market.